Can you sense that the party season is approaching? 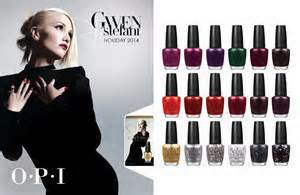 This OPI Gwen Stefani Holiday collection gives you all the color you need for the year-end functions! Different tones of Red, dark shades & glitters for creating elegant, wild, dramatic looks to showcase your own style. Check out the 18 shades and if you want extra luxe, add on HRF19, a Topcoat with 18K Gold flakes! HRF02 Kiss Me – or Elf!